What if the Tour de France expanded its prize list to include more team competitions? Let’s imagine the possibilities beyond the traditional best team classification which Team Saxo-Tinkoff earned in the 100th edition of the French Grand Tour. 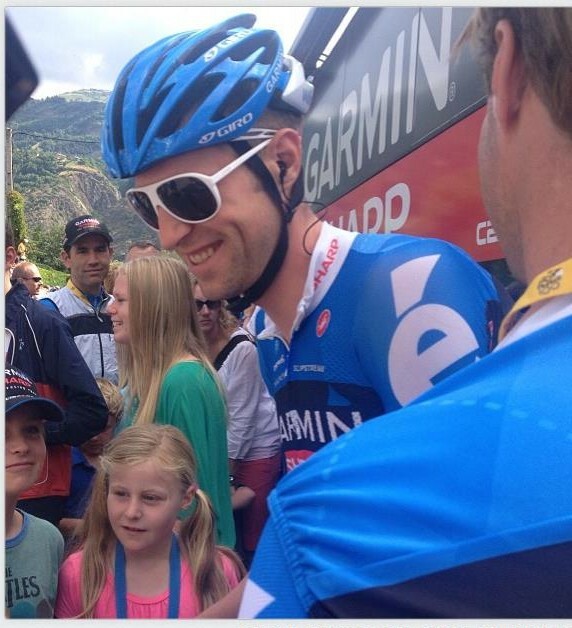 Best accessorized team: Garmin-Sharp: Ryder Hesjedal’s POCSports sunglasses drew a lot of attention with their retro style. Tom Danielson traveled across France with a little green dinosaur astride his bike, a gift he received from his son as he left home from France. Most fun team: Orica-GreenEDGE. These boys know how to race but they also know how to play. On the first rest day the team released a video showing the guys and fans rocking out to AC/DC with blowup mini-guitars. The video’s been removed from YouTube but you can still find descriptions and stills from the video. Most invisible team: Lampre-Merida. Roberto Ferrari flashed the team’s pink with a fifth place on the Champs-Elysées. Jose Serpa and Damiano Cunego appeared occasionally on the camera. But overall the team didn’t make its presence known as much as the other teams, aside from maybe Cofidis. Lampre also brought up the rear when it came to overall team earnings. It took away 11,180 Euros. Most aggressive team: Leopard-RadioShack. This is a tough call. Jan Bakelants and Jens Voigt were on the attack again and again. In the end their shows of force won the team this category. Best lemonade making team: BMC Racing Team. The Swiss squad didn’t live up to the heavy expectations the media set on the team, most notably a high GC placing for Tejay Van Garderen. But the team never threw in the towel and turned lemons into lemonade by placing many riders in break-aways. Van Garderen was on the attack in stages 14, 18, and 20. Philippe Gilbert, Manuel Quinziato, and Marcus Burghardt factored into escapes; Quinziato rode in a break on the Champs-Elysées. Most flamboyant team: Cannondale Pro Cycling. This team nets this prize based on lime green wigs at sign-in, Peter Sagan’s green facial hair on stage 21, and Sagan’s ever-present wheelies. Most passionate team: AG2R La Mondiale. The French team wins this prize based on several performances. Jean Christopher Péraud attempted to defend his ninth place best French rider position by starting the stage 17 time trial despite having injured his collarbone earlier during course reconnaissance. He subsequently crashed during the TT and withdrew from the Tour. After Christophe Riblon won on Alpe d’Huez, he and Péraud spoke by phone to celebrate. The team worked hard to keep the best French rider distinction and succeeded. Twenty-two year-old Romain Bardet fought for high stage results and ended the race as best-placed French rider in 15th overall as well as fourth in the white jersey competition. « An America primer for pro-cyclists coming to race in the U.S.